It didn't take long for the rains to do their usual thing at this year's U.S. Open. Early this afternoon — day one of the Open — the skies over Flushing opened up and pooped the party for about two hours. Courts were fled, matches were delayed, and humans everywhere wished that our species had, like many others, invented some sort of method for avoiding inclement weather. 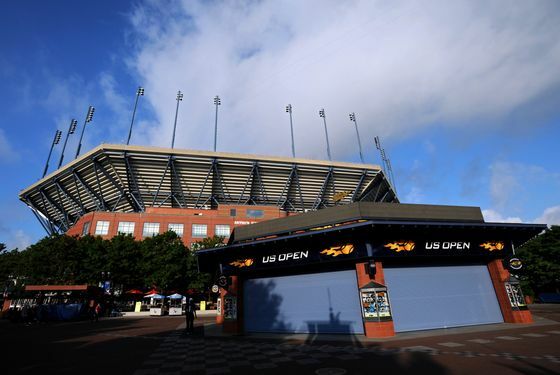 Seriously, though, there's still no roof over Arthur Ashe Stadium, but U.S. Open officials insist that — even if Ashe doesn't get a hat during the upcoming round of renovations, which it won't — the goal is to roof it as soon as possible. Putting a roof on Ashe basically means putting a building on top of a building, so, Smith said, the U.S.T.A. planned to remove the concrete from the upper deck in Ashe and replace the stands there with lighter material, while only losing “within a few hundred” seats. Officials would then put a roof made of lightweight materials on top. The idea is the total weight would remain the same. So, we'll one day live in a world without U.S. Open rain delays, at least for major matches. When that day will come is anyone's guess. At least one long-awaited upgrade to the tournament has its arrival date: Smith guaranteed that next year's Open will have a built-in rest day between the semifinal and final matches. The 2013 finalists might be soggy, but at least they won't be as tired.